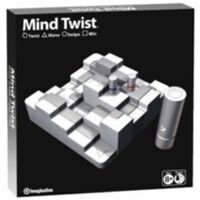 Mind Twist is a game of strategy for both adults and kids alike. While playing the game Mind Twist, you'll try to guess your opponent's next move and figure out their strategy to try and beat them to the finish line. Mind Twist will keep you on your toes and make you want to play over and over again. Mind Twist rules and instructions are easy to learn and will quickly get you playing like a champ. Try playing the Mind Twist game with your friends today! A player may dial more than the number of spaces actually required to reach the finish – you do not need an exact count to reach the finish. In Mind Twist, you try to outwit your opponent and be the first player to the finish! Mind Twist will have the game platform, a number dial, 2 player tokens and the Mind Twist game rules and instructions. Please keep in mind that the official Mind Twist party rules and instructions could be different depending on the game version you have. The rules below are some of the exact directions on how to play Mind Twist. Share with us your comments, funny stories, tips, advice, strategies, creative ways to play, questions about how to play, problems with the rules or anything you want about Mind Twist. All submissions will be reviewed within 24 hours. Click here to add your Mind Twist comments.